About "ESV Study Bible Large Print (Black Letter Edition)"
This premier study Bible is packed with expert annotations, full-colour maps, illustrations, charts, timelines, and topical articles by an outstanding team of 93 evangelical scholars. Single-column, 11-pt text. The ESV Study Bible, Large Print includes nearly all the features of the award-winning ESV Study Bible in highly readable, large-print type. A new typesetting allows for increased readability while maintaining the same trim size of the original. Some of the original's extensive articles have been moved online for free access to help save on bulk, but all of the original's 20,000 study notes, 240 maps and illustrations, charts, timelines, and book introductions are included in a two-color interior. Those looking for the ESV Study Bible in a readable and reasonably sized format will enjoy this large print edition. 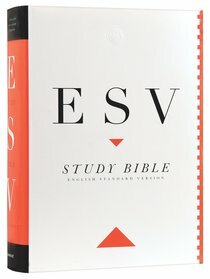 Customer Reviews For "ESV Study Bible Large Print (Black Letter Edition)"
I have been thrilled with my purchase of the ESV Study Bible in Large Print. The commentary and reference notes are a good size making Bible Reading easier. The notes are very thorough and understandable and a perfect accompaniment for my bible reading time. The study bible has been very helpful in growing my knowledge of God's word. The ESV Study Bible itself is already much used and has been well reviewed extensively. It's an ESV Bible, which is an 'essentially literal" translation that is designed to help readers "understand the Bible in a deeper way"...  combined with a very comprehensive set of study material. (For a good review of this study bible, see: Naselli, Andrew David. "Review of Grudem, Wayne A. The ESV Study Bible." Journal of the Evangelical Theological Society 52, no. 2 (2009): 357-59, Accessed from http:www.etsjets.org ). In terms of this edition, the two biggest plusses are the hardback format (this is a weighty tome, and the hardback form lets it stand up to being roughly handled) and the 11 point font for the main biblical text, which means it is the most visually accessible version I have ever owned. No more squinting at tiny unreadable text (although it should be pointed out that the notes are in smaller 9 pt)! This was given as a gift, and it is perfect for the readability of the ESV Bible itself, and the excellent footnotes that are well researched. NOT a pocket bible for carrying in your purse, but great for the desk when you need to sit down and study the Bible carefully.